Drew McDonald (34) shoots in the game against IUPUI. After two double digit performances over the weekend, McDonald was named Horizon League Player of the Week Monday afternoon. It is the second time this season a Norse player has been earned the honor this season; Holland was honored on Nov. 20. Over the weekend, McDonald averaged 22.5 ppg, 11.5 rpg, five assists and 1.5 steals during the two game road trip against Youngstown State and Cleveland State. He converted 74 percent of his shots from the field. 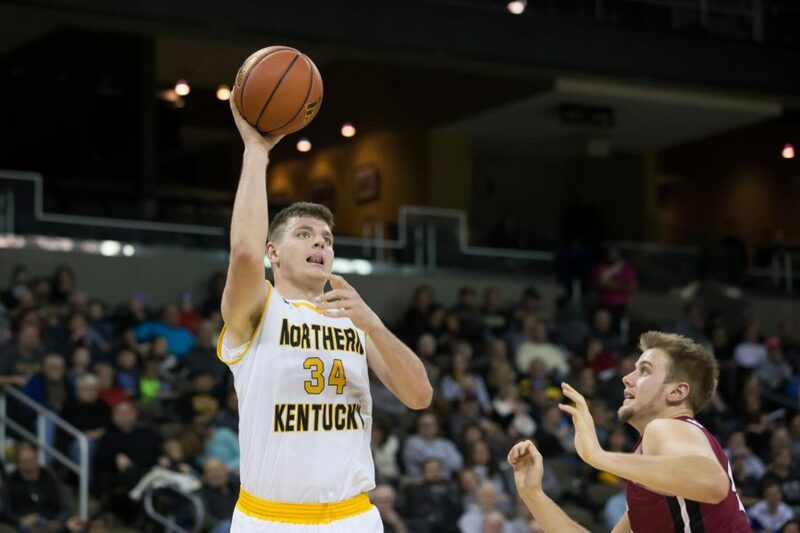 McDonald exploded for 26 points and 16 rebounds in NKU’s 95-85 victory over the Penguins on Thursday. The junior forward was 9-11 from the field and 2-3 from three. He now leads the Horizon League with 11 double doubles on the season. McDonald dished out a career high seven assist and scored 19 points on 8-12 shooting from the field against the Vikings on Saturday.